Bothalia published original papers and short notes dealing with the flora and vegetation of southern African and related subjects. 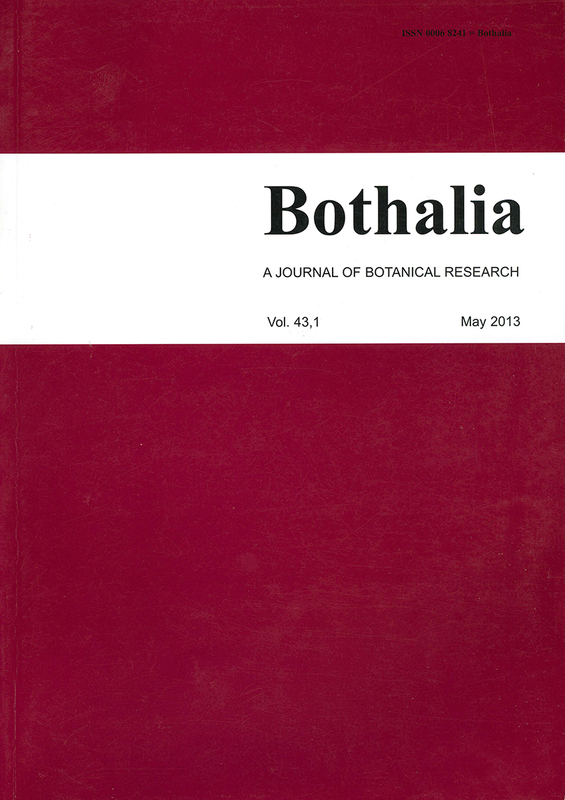 Contributions to the Flora of southern Africa were also published in this series. Published by the South African National Biodiversity Institute (SANBI). Nine articles, including: The Cape genus Micranthus (Iridaceae: Crocoideae), nomenclature and taxonomy; New taxa of Hesperantha (Iridaceae: Crocoideae) from the southern African winter rainfall region and a review of the H. pilosa complex; Eight new species of Moraea (Iridaceae) from southern African with range extensions and morphological notes in the genus; FSA Contribution 22: Asteraceae: Calenduleae: Garuleum; The native and naturalised species of Peltocalathos and Ranunculus (Ranunculaceae: Ranunculeae) in southern Africa; and A new infrageneric classification for Mesembryanthemum (Aizoaceae: Mesembryanthemoideae). Nineteen new species of Albuca, Hesperantha, Isoëtes, Lessertia, Micranthus, Moraea and Pelargonium. Eleven articles, including: A taxonomic review of the dry-fruited species of Anemone (Ranunculaceae) in southern Africa; Pollen morphology of members of southern African Boerhavia and Commicarpus (Nyctaginaceae); A revised infrageneric classification and synopsis of the Afro-Eurasian genus Moraea (Iridaceae: Irideae); Review of chromosome cytology in Moraea (Iridaceae: Irideae): what chromosomes reveal about the evolution of the genus; Exsiccatae in the bryophyte collection of the National Herbarium, Pretoria. New species of Chenolea and Lasiosiphon. 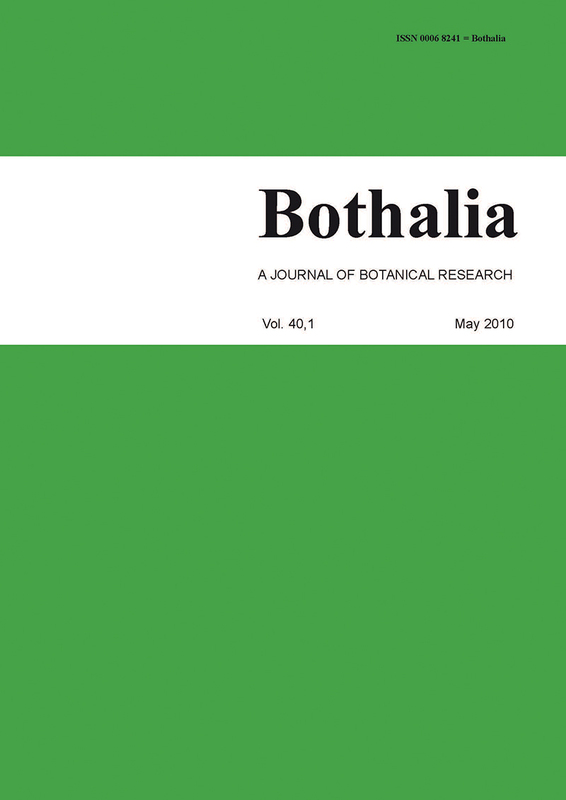 Ten articles, including: The emerging invasive alien plants of the Drakensberg Alpine Centre, southern Africa; Systematics of the southern African genus Ixia (Iridaceae: Crocoideae): 4. Revision of sect. Dichone; Systematics of the hypervariable Moraea tripetala complex (Iridaceae: Iridoideae) of the southern African winter rainfall zone; A taxonomic revision of the southern African native and naturalized species of Silene (Caryophyllaceae); Nomenclature and typification of southern African species of Euphorbia. Eighteen new species and eight new subspecies of Babiana, Euphorbia, Ixia, Moraea and Silene. 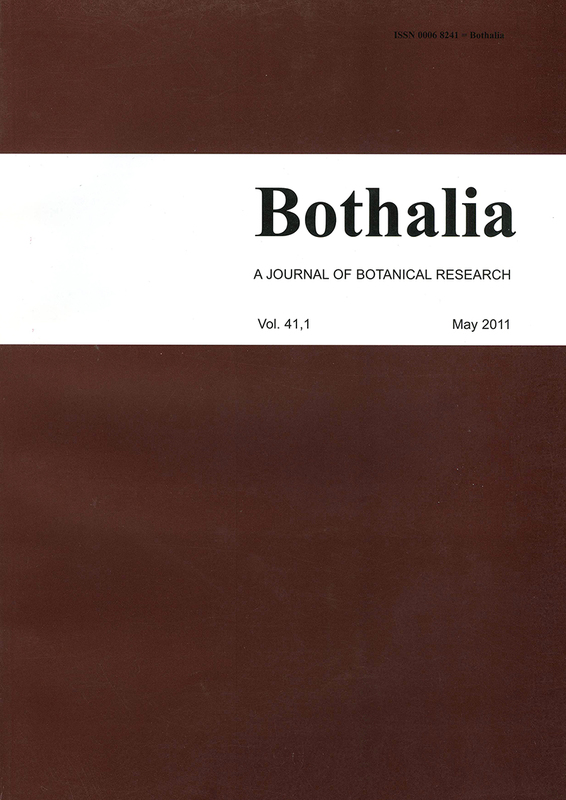 Seven articles, including: Revision of the genus Sphenostylis (Fabaceae: Phaseoleae) in South Africa and Swaziland; anatomy of myxospermic diaspores of selected species in the Succulent Karoo, Namaqualand, South Africa; recircumscription and distribution of elements of the ‘Ceterach cordatum’ complex (Asplenium: Aspleniaceae) in southern Africa; new species of Bauhinia, Berkheya, Cyanella and Osteospermum. 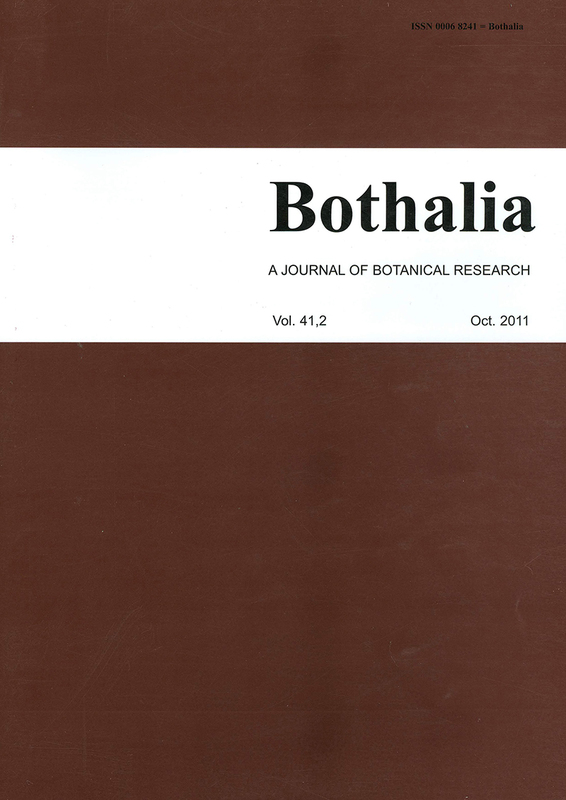 Fourteen articles, including: Ornithoglossum pulchrum (Colchicaceae: Colchiceae), a new species from southern Namibia; Taxonomic revision of the genus Thereianthus (Iridaceae: Crocoideae); Review of the genus Xenoscapa (Iridaceae: Crocoideae), including X. grandiflora, a new species from southern Namibia; Phytosociological description of norite koppies in the Rustenburg area, North West Province, and refinement of the distribution of the Norite Koppies Bushveld on the national vegetation classification map of South Africa; The extended occurrence of Maputaland Wood Grassland further south in KwaZulu-Natal, South Africa; New species of Albuca, Ammocharis, Lachnospermum, Ornithoglossum, Rhynchosia, Romulea, Thereianthus, Xenoscapa and Xiphotheca. A tribute to the outgoing technical editor, Beverley Momberg, is also included. Eight articles, including: Systematics and biology of the African genus Ferraria; Annotated catalogue of the flowering plants of São Tomé and Príncipe; A conspectus of Combretum in southern Africa; Generic status of Quisqualis; New liverwort distribution records in South Africa; A review of the medicinal ethnobotany of Lesotho; New pteridophyte records for the flora of Swaziland; New species of Adenogramma, Ferraria, Ixia, Metathelypteris, Pilularia, Tritonia and Wahlenbergia; new subspecies of Cheilanthes, Ferraria, Gasteria and Ixia. A tribute to the outgoing scientific editor, Gerrit Germishuizen, is also included. Nine articles, including: Taxonomic notes on the Clathraceae (Phallales: Phallomycetidae) and Bottomly’s species of Lycoperdon (Lycoperdaceae–Gasteromycetes); Checklist of ferns and seed plants of the Golden Gate Highlands National Park; Discussion on the perceived homogeneity of West Coast Renosterveld and the implication for conservation; New species of Berkheya, Bulbinella, Colchicum, Didymosalpinx, Geosiris, Helictotrihon, Heterorhachis, Moraea, Nemesia, Oxyanthus, Pentameris and Senecio. Eight articles, including: A generic classification of the Restioneae of southern Africa; Pollen and reproductive morphology of Rhigiophyllum and Siphocodon; Floristic composition of wetlands of the South African section of the Maloti–Drakensberg Transfrontier Park; An ecological review of harvesting impacts on wetland plants; New species of Aloe, Babiana, Brunia, Elegia, Ixia, Restio, Rhodocoma, Thamnea, Trieenia and Zaluzianskya; new subspecies of Babiana. 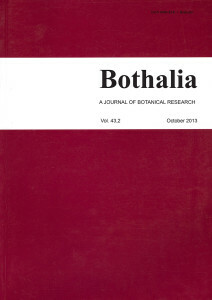 Nine articles, including: Taxonomy of the genus Keetia (Rubiaceae–Ixoroideae); Aloe names, with notes on nomenclature and typification; The botany of the Cunene–Zambezi expedition with notes on Hugo Baum; New species of Acacia, Albuca, Drimia, Euphorbia, Geissorhiza, Panicum and Pseudogaltonia; new subspecies of Pseudoprospero and Trichoneura. Twelve articles, including: Aloe in Angola; A revision of Fumariaceae in southern Africa; A review of the genus Curtisia; Taxonomy and phylogeny of two subgroups of Pelargonium section Otidia (Geraniaceae); Closing bodies in the capsular fruits of Aizoaceae–Ruschioideae; New species of Aloe, Diascia, Gladiolus, Moraea, and Nemesia; New subspecies of Cysticapnos. Ten articles, including: Systematics of the southern African Ixia (Iridaceae); Updates and corrections in Asteraceae; Developmental variation in a species of Isoglossa (Acanthaceae–Ruellioideae); Species delimitation in Carvalhoa campanulata (Apocynaceae–Rauvolfioideae); Diversity and species turnover on an altitudinal gradient in the Western Cape, South Africa: baseline data for monitoring range shifts in response to climate change; New species of Aponogeton, Drosera, Gymnosporia, Ixia and Selaginella. 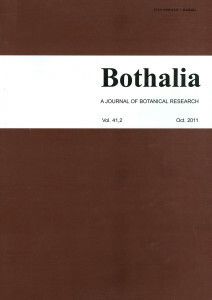 Nine articles, including: Systematics of the southern African Ixia subgenus Morphixia (Iridaceae); The genus Solanum (Solanaceae) in southern Africa: subgenus Leptostemonum, section Giganteiformia; The genus Wellstedia (Boraginaceae: Wellstedioideae) in southern Africa; Vegetation and vegetation-environment relationships at Grootbos Nature Reserve, Western Cape; Resource demand estimates for sustainable forest management in Mngazana Mangrove Forest, South Africa; New species of Asparagus, Babiana, Drimiopsis, Euclea, Huernia, Ixia, Metalasia, Oxalis, Romulea and Tripteris; new subspecies of Ixia. Eleven articles, including: A revision of Ornithogalum subgenus Aspasia section Aspasia, The chincherinchees; Name changes in the Old World Rhus and recognition of Searsia; Invasive, naturalized and casual alien plants in southern Africa; Stem diameter and bark surface area of the fluted trunk of Balanites maughamii; Seasonal variation in soil seed bank size in Maputaland; New species of Aristea, Ceraria, Dewinteria, Drimia, Hesperantha, Nivenia and Ornithogalum; New genus: Dewinteria. Eleven articles, including: Patterns of plant diversity and endemism in Namibia; Comparisons of invasive plants in southern African originating from southern temperate, northern temperate, and tropical regions; New species of Iridaceae from the Hantam–Roggeveld Centre of Endemism, and the Bokkeveld, Northern Cape, South Africa; New species of Corchorus, Ixia, Lachenalia, Moraea, Pentaschistis, Romulea and Spiloxene. Eleven articles, including: a taxonomic revision of Merciera (Campanulaceae); Hypoxis: list of species and infraspecific names; Sesotho names for exotic and indigenous edible plants in southern Africa; Reappraisal and identification of Olinia rochetiana (Oliniaceae) in South Africa; Floristic composition of gold and uranium tailings dams on South Africa’s deep-level mines; New species of Aloe, Commiphora, Drimia, Erica, Maerua, Nemesia, and Ornithogalum; new variety in Clivia.